Francis Wilfred Chauvin was born in 1934 and grew up in Riverside, Ontario. In 1953, he became a policeman. In the 1970’s, Chauvin became a police detective with the Windsor Police Department and served in the Special Investigations Unit (SID). 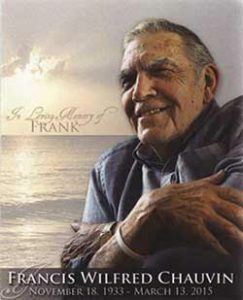 Early in his life, Frank had a desire to help the needy and the poor. In December 1974, Frank and his wife Lorraine drove a truck up to Madonna House near Pembroke, Ontario. Not only was the truck filled with toys for the children of the community, but they also had it packed with winter clothing and food. Chauvin continued helping those in need. It did not matter where you came from, if you were in need, Frank was eager to help. Among some of his humanitarian missions were bringing food to the people in drought-stricken Ethiopia; settling newly arrived Vietnamese boat people in Windsor; and assisting a Salvadoran family move into a new apartment during the coldest days of December. In 1988, Chauvin made one of the biggest decisions in his life: he decided to retire from the Windsor Police Dept. after a 32 year career. It was more important to him to continue his work helping the poor and disadvantaged than to continue doing police work. One of his most important projects began in 1988 when he founded an orphanage for girls in Haiti. This was the House of God’s Daughters (Foyer des Filles de Dieu). Many people recognized that Chauvin truly was a humanitarian, and they donated food and clothing for his causes. Relations Award from the local IODE Chapter. He was the recipient of the Gordon Preston Memorial Award. This award is given by the Windsor Police Association in 1986. He was appointed to the Order of Canada in 1987. Although he had received many such awards, Chauvin’s real motivation was the urge to help those in need. His true reward was to see these unfortunate people feeling better and more at ease. Detective Chauvin remained a humble person. He always thanked his wife Lorraine and his family for helping in these many charitable works. He has received much support from his friends, the Police Department, and many people in Windsor and Essex County who have helped him in many ways. Francis Wilfred Chauvin died on March 13, 2015. “Frank Chauvin.” Wikipedia. August 5, 2013. Accessed March 1, 2016. “Windsor Humanitarian Frank Chauvin Dies at 82: ‘” Windsor Star, March 13, 2015. Accessed February 23, 2016. “$17,000 collected for Chauvin’s dream” Windsor Star, (Windsor, Ont. ), February 1, 1988, Section A. “Chauvin wins police humanitarian award” Windsor Star (Windsor, Ont. ), December 3, 1986, Section A.
Powless, Lynda. “His ‘beat’ Is Helping People.” Windsor Star (Windsor, Ont. ), March 23, 1985, Section A.
Priddle, Alisa. “Chauvin orphanage opens soon” Windsor Star (Windsor, Ont. ), February 29, 1988, Section A. “To IODE, He’s City’s Top Cop.” Windsor Star, February 9, 1981, Section A.